Chapter 145 - Reg. of Farm Product - Welcome Coffee Growers! Chapter 145 provides information regarding the definition of a farm product dealer (part I) in Hawaii, the requirements and responsibilities of a dealer, duties of the department, as well as rules and regulations pertaining to complaints, investigations, remedies and penalties by dealers. Additionally, this chapter provides information regarding the ownership and movement of agricultural commodities (part II) within Hawaii and provides information regarding the definition the ownership and movement of agricultural commodities, form documentation requirements, proof of ownership or lack there of, inspection, enforcement, penalties, and the seizure of commodities. 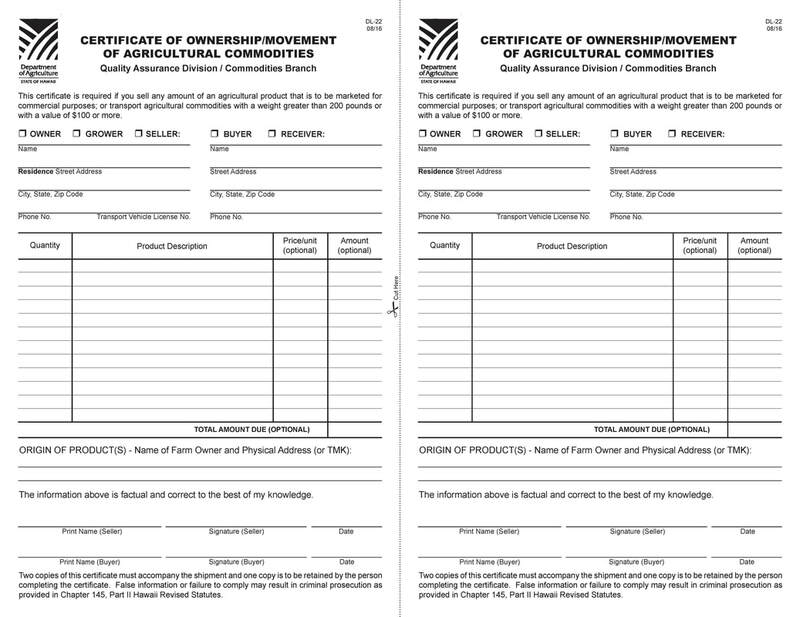 If you sell any amount of an agricultural commodity that is to be marketed for commercial purposes; or transport agricultural commodities weighing more than 25 pounds or the value is $100.00 or more, an ownership and movement certificate is required by law. **Information on forms and handouts may not reflect recent changes and amendments related to agricultural theft. Refer to amendments above.